Albuquerque NM Homes for Sale - C.A.R.E.S. 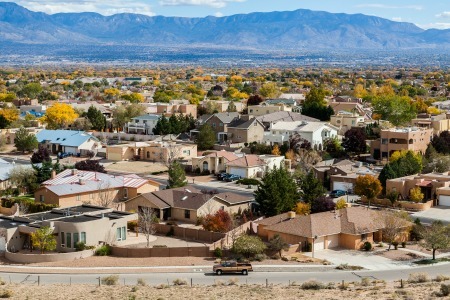 The most populated city in Bernalillo County, Albuquerque is home to approximately 559,121 New Mexico residents. The most recent census recognized 222,098 households in the city. When considering the 187 square miles of land area and the current population, this city has a population density of 2,907 people per square mile. Just one visit to this beautiful city begins a love affair that includes incredible scenery, delicious regional dishes, a thriving economy, and an affordable lifestyle. If that isn’t enough, you’ll enjoy some of the best golf in New Mexico, excellent schools, and a plethora of outdoor activities. There are four quadrants in Albuquerque. Experience the rich history of this city in the Northwest Quadrant. You’ll also find commercial, residential, and ranch properties in this area. You’ll find the University of New Mexico and many affluent neighborhoods in the Northeast Quadrant. Other affluent areas and Kirkland Air Force Base are in the Southeast Quadrant. The Southwest Quadrant is where you’ll find more rural areas and neighborhoods with both older and newer homes. Albuquerque Public Schools serves the students of this area. The largest district in the state, they have 129 schools and enroll approximately 95,000 students annually. The district manages 89 elementary school, 27 middle schools, and 13 high schools. The median household income is $47,030. The median home value is $185,300. The average commute time is 21 minutes. The percentage of residents with a high school diploma or higher is 89%. The percentage of residents with a bachelor’s degree or higher is 33.5%. Wondering about the weather in Albuquerque? The average high temperature is 90 degrees in July. The average low temperature is 26 degrees in January. This area receives an average of 9.39 inches of rainfall annually. The month with the most rainfall is August. If you’re looking for snowfall, your best chance comes in December. This area receives around 10 inches of snow each year. Your real estate agent is the best source of information about the local community and real estate topics. Give C.A.R.E.S. a call today at 505-435-9700 to learn more about local areas, discuss selling a house, or tour available homes for sale.